This charming, waterfront cottage has all the comforts of home, fully furnished with a mix of nautical and antique furnishings. Sit back, relax and enjoy the spectacular views of Rockland Harbor and The Breakwater Lighthouse. Walking distance to Rockland where they hold the annual Lobster Festival, North Atlantic Blues Festival & Maine Boats and Harbors Show. Enjoy the open porch overlooking the harbor. Enjoy the neighboring beach, which is a great spot to launch a kayak from. Sit on the porch in the evening and watch the sun's reflection off the Breakwater Lighthouse. Short walk to downtown Rockland, museums, cinema, schooners, shopping, and fabulous restaurants. BEACH CLASSIFICATION: We have categorized this property as having or being near a sandy beach. More specifically for this property - there is a pea-sized / pebbly beach about 200 feet wide to the left of the cottage. Not necessarily a "swimming beach" - this is a good beach for sitting and relaxing in folding chairs or for launching kayaks. There is not an actual fine sandy beach at this property, but the beach itself is better than most in the area and that is why we have classified it as being "on" a sandy beach. Most guests will be more interested in going to the beaches located a 2 miles further away in Owls Head such as Crescent Beach, Crocketts Beach, or Birch Point Beach State Park. NEED EXTRA ROOM? Just a short distance away, is a quaint comfortable guest suite, which can accommodate another couple (2 guests), while remaining close to the rest of the group. Click HERE to visit the Owls Head Guest Suite property page. BOATS INCLUDED? None, this is not a property to boat from (although you can kayak with your own or a rental kayak from the nearby beach). The public boat launch is less than a mile away however. The agency was very helpful when we called for assistance with lightning and linens. When the garbage disposal started to leak I phoned the after hours line and it was answered immediately. A plumber came the first thing the following morning and put in a new disposal. He was friendly and thorough. Very impressive! As always we were impressed with the accommodations through On the Water in Maine. We love the view and also love seeing the working harbor. The neighbors are friendly. One of the easiest online experiences for booking a cottage. The instructions were thorough and easy to understand as were the tips. Did not have any personal contact except for check in and that was brief. Loved the cottage. The view of the harbor and boats from the porch and living room was surreal. The cottage was very clean and had a well stocked kitchen. The beds were comfortable and the shower was great. The home is well maintained and shows that the owners take pride in ownership. We also loved the quiet location and the easy walk into Rockland. There is so much to do close by but we really enjoyed the Owls Head lighthouse state park. Our biggest day trip was to Acadia and Bar Harbor. Very enjoyable but it was nice to return to our quiet little area. Would highly recommend this cottage. On the Water in Maine is a quality organization. The communications are personal and when you call or communicate by email the conversations are personal and top notch!! 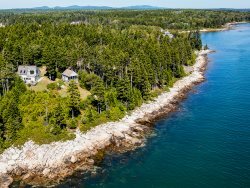 On the Water in Maine is great place to go if you want to find the best properties on the mid-coast area. Seaside Cottage is a favorite of ours. We stayed there while it was rented by the owners and are so pleased to return with On the Water in Maine. We love the views and the fog rolling in on the "Maine" days. As we have on many trips before we love the weather surrounding us. We have rented through other agencies as well as private owners before, but On the Water in Maine has been by far the best experience. Communication was exceptional. Every person we had contact with was very professional and knowledgable. Thank you for your assistance in providing us with a wonderful place to stay while visiting Maine! We are known as Minnesota nice, but our experience with On the Water in Maine showed us Maine nice! The house had an amazing view of the water. It was also super comfortable and immaculate. The view is absolutely spectacular, from the living room, bedroom or deck. The little rocky beach is just a short walk around the corner where you can swim, launch a kayak or sit sit on the beach. The living room was very comfortable and the kitchen is spacious with modern appliances. Both bedrooms have attached walk in closets so it was easy to store suitcases out of the way and feel at home. We've been guests of On the Water in Maine several times and have found consistently high quality in both the properties and the service. The staff has been friendly and helpful. We will definitely continue renting through OTWIM for years to come. We loved our stay at the Seaside Cottage. The view of the harbor is spectacular and the location is great, being quite close to Rockland. The house is well appointed and comfortably furnished. Open floor plan on first floor is stunningly successful. Wonderful harbor views from living and dining room/kitchen. All MAYTAG stainless steel appliances...real quality. Location incredible! Right near new Harbourview Y fitness center and Rockland. Just blocks from Primo. Working with On the Water in Maine is a pleasure. Have rented with others but it was not as nice. The house was perfect, rented many homes in Maine but this was by far the best. Location is great the view was perfect. Private but close to everything. House was very clean and well stocked. We have worked with On the Water in Maine Inc. for a number of years now, and we couldn't imagine working with anyone else. Every step in the process is clearly and concisely communicated with you. The website is excellent, and everyone on the staff is knowledgeable, helpful and professional. We loved the open floor plan downstairs and the view - the beautiful open view of the Rockland Breakwater Lighthouse, sailboats and water. Very much enjoyed our stay at Owl's Head. House was lovely, beautiful view and easy access to many places of interest. Love the state of Maine, have been going there for many years but this was the first time in the mid coast area and we truly enjoyed it. Beautiful scenery. On the Water in Maine was easy to work with, from the first phone call to the last. We didn't experience any problems with our rental, but based on the conversations I had with renting, checking in and out, I am confident that they would have been receptive and quick to take care of any issues. This was by far the cleanest and best equipped rental we have ever experienced. Seaside Cottage was a dream come true! By far my favorite home rental (and we have rented many). The view out of the windows was amazing and we enjoyed the beautiful sunrises each morning and the calm evenings on the bay. The deck was perfect to enjoy both mornings and evenings. It seemed as if the cottage were made for us, from color scheme to furniture selections. It offered everything we needed. We felt right at home and would come back to Seaside Cottage in the future. Always a good experience with On the Water in Maine. Had a (minor) problem with the oven. You responded in record time. That shows your attentiveness to renter's needs. Great place - loved the newness of everything. All the amenities you could ask for. Property was as represented and administrative matters went flawlessly. Truly a first class experience. Great value for money. Location was perfect. House and furnishings exceeded expectations. Service from managers timely and efficient. Could not have asked for nothing more. We thought that all interactions with the agency were well defined and very specific. It was good to know that they were representing quality stds. in their rental properties. The condition of the home was excellent and the views were very impressive. ON THE WHOLE, WE WERE IMPRESSED WITH EFFICIENCY OF DOING BUSINESS WITH ON THE WATER IN MAINE. WE VERY MUCH ENJOYED OUR STAY AT SEASIDE. THE UNOBSTRUCTED VIEW TOWARD ROCKLAND HARBOR IS A BIG PLUS FOR THIS PROPERTY. IT'S CONVENIENT TO ROCKLAND, YET VERY QUIET - HARD TO BEAT! On the Water is a great company...personable and easy to work with. Everything is clear and communication is good and timely. We had an issue with the lock on the door, and we reached Justin by phone in the evening on the first try. He was there the next morning to take care of the problem. Our stay was wonderful. The house is clean and comfortable. We love sitting on the deck in the morning watching the sunrise over the water. We appreciate the comfortable seating and the great kitchen. Our only concern is the rising price; it is headed out of our range. Excellent, very friendly service. We broke one of the outdoor chairs, and it was replaced quickly by On the Water in Maine staff. Thank you! Great house. We love the view , the porch and the proximity to town. On the Water in Maine is a wonderfully responsive and reputable company. Their properties are well maintained and well represented on the web site. Seaside Cottage is a beautifully appointed home with a spacious floor plan. The hardwood floors, lovely decor, and bay views of Rockland Harbor made for a very comfortable stay. On the Water in Maine was wonderful to work with--very friendly and professional. The Seaside Cottage was very pleasant and comfortable. The house was bigger than I expected, and the layout was great for staying organized. Very clean. Great views. On the Water in Maine was a very knowledgable and very helpful team. Seaside Cottage is a modern home decorated very nicely - spacious.